View More In Padlocks & Hasps - Page 4. 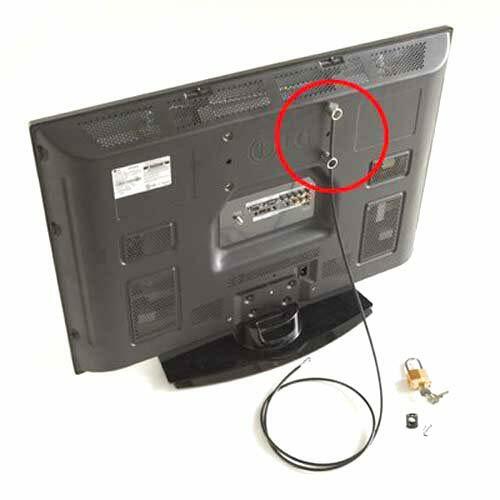 Proven anti-theft solution for flat screen televisions! Works with TVs on wall mounts or furniture. Includes VESA compliant screw pack, 2-steel fittings, 1-4' EX aircraft cable (superior cut resistant weight), 1-security mounting node with mounting screws and 1 brass padlock. Special "no-access" caps prevents removal of security cable. Locks will be keyed alike when ordering more than one. If looking for an even stronger version, search for TV lock Commercial Strength. If you have any questions about this product by Lyon & Smith, contact us by completing and submitting the form below. If you are looking for a specif part number, please include it with your message. Guard Security Keyed Padlocks - Set of 3 High Security Padlocks with 6 Keyed Alike (Matching) Keys - Great Value!